Eleanor Baum was born in Poland which she escaped with her parents, during World War II. She grew up in Brooklyn, New York. Dr. Eleanor Baum received her bachelor degree in Electrical Engineering from City College and her PhD in Engineering from Polytechnic Institute of New York. She has honorary Doctor of Science degrees from The Cooper Union, Union Collage and Trinity Collage. She serves on the board of Avnet, Inc., which is a firm specializing in electronics. She is chairwoman of the Board of Governors of the New York Academy of Sciences, and a director of Allegheny Power Systems, and the United States Trust Company. a She has been a Fellow of the IEEE, the Society for Women Engineers (SWE), and the Order of the Engineer. 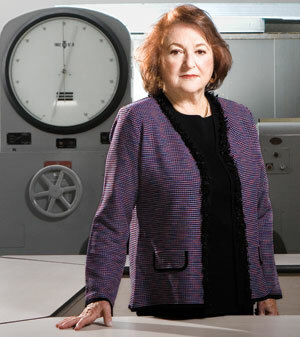 Dr. Eleanor Baum taught at Pratt Institute and became dean of its engineering school in 1985. She was the nation’s first female engineering dean. Dr. Baum was named dean of Cooper Union’s Nerkin School of Engineering in 1997. During her years at The Cooper Union, the female enrollment rose from 3% to 30%. This entry was tagged Eleanor Baum. Bookmark the permalink.